by Joseph Brennan. Copyright 2001, 2002. 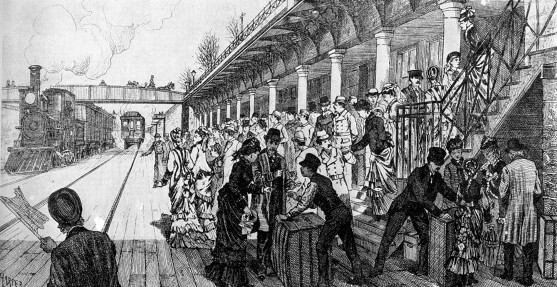 Passenger service: about December 1874 - about November 1895. Existing abandoned portions: part of platform and trackways. The Harlem station in open cut was constructed by the New York Central and Hudson River Railroad in 1873-1874 as part of the Park Avenue Improvement. It replaced the ground level station opened in 1844 by the New-York and Harlaem Rail-Road. The Improvement widened the railroad to four tracks and got it off street level. The open cut extended from 115 St to about 130 St, with one station extending from 125 to 126 St. The short platforms were used only by Harlem Division local trains, not trains of the New York Central's Hudson Division or the New York, New Haven, and Hartford Railroad. Harlem service was greatly expanded in May 1876 by the rapid transit service operated to Williams Bridge, which with the main Harlem Division services amounted to about an hourly service to Grand Central. The open cut station was used for only about twenty years. A plan to open the Harlem River to navigation took hold in the late 1880's, culminating in the opening in 1895 of the Ship Canal at 225 St that provided a deep water connection to the Spuyten Duyvil Creek and the Hudson River. The Park Ave railroad bridge was low and had to open for all but the smallest boats. 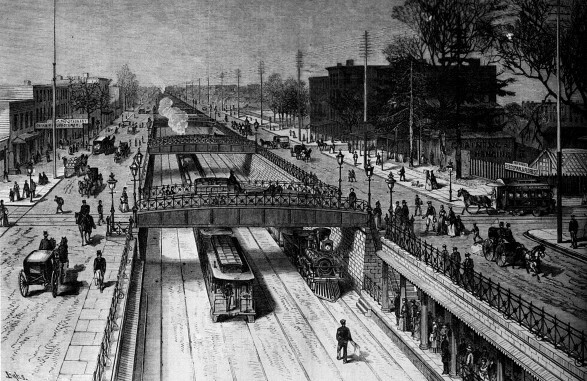 The New York Central therefore built a higher level drawbridge, and that in turn meant raising track level though Harlem by filling in the cut and replacing it with a steel viaduct similar to the elevated railroads in Manhattan although of somewhat heavier design. During the reconstruction the tracks were probably relocated to each side of Park Ave, around November 1895. A temporary Harlem station was built from 124 to 125 St and seems to have opened about January 1896. In April the railroad announced plans to build a large new station that would accommodate through trains for the first time in addition to local trains. A New York Times article of 6 April noted that "hitherto a few local trains have stopped in the tunnel at 125 St" and that with the new plan "residents of Harlem will no longer be obliged to go to 42 St to get out of New York". The new drawbridge and viaduct opened in February 1897. Directly under the station is a large cellar, formed by that portion of the old cut which has not been filled in. This has been cemented, and here are steam-heating and electric-lighting plants. A portion of this cellar will be transformed into a vault for the storage of books and papers belonging to the company. Because the abandoned station is now underground, it qualifies as an abandoned underground station. Facing downtown, we see the station, the stone-walled cut, the iron fences and bridges, and the 125 St Crosstown horsecar. The station platform is under the street surface, and accessible only by stairs at each end. The platform is three steps up from the floor of the cut. The sky suggests night; the shadows suggest mid morning. Trains ran left-handed in Park Ave because at Grand Central the arriving platforms and engine yard were on the left side. In order to keep engines out of the trainshed at Grand Central Depot, the procedure for over thirty years was to separate the engine and train en route near the terminal, a maneuver called a "flying switch". The engine was switched into the yard, and then the switch was quickly re-set so the train could coast into the station and be brought to a stop with hand brakes. In another view from track level, the entire short length of the station can be seen. Much artistic license is taken: the passengers spilling over the local track with baggage, the flagman waving at the departing train, and the trains keeping to the right. But the detail of the station seems true to life, and the artist merely populated it with the people and trains for dramatic effect. Compare the three steps down from the platform, where these passengers should be standing, with the picture above. The station may have been painted in bright colors. There are windows in the walls, so there must have been spaces under the street for a ticket office, waiting rooms, and the usual closets. 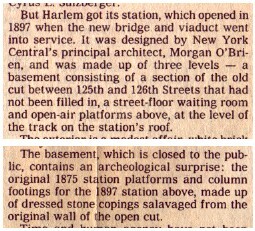 A cutting from the New York Times of 18 September 1988 details the station reconstruction planned by Metro North and completed in 2001. The description seems partly copied from the archival article of 1897, but still the reporter seems to have seen the lower level in 1988 and confirmed it was still there.